The bike we’ve been waiting for Indian to build is here. Well, almost. 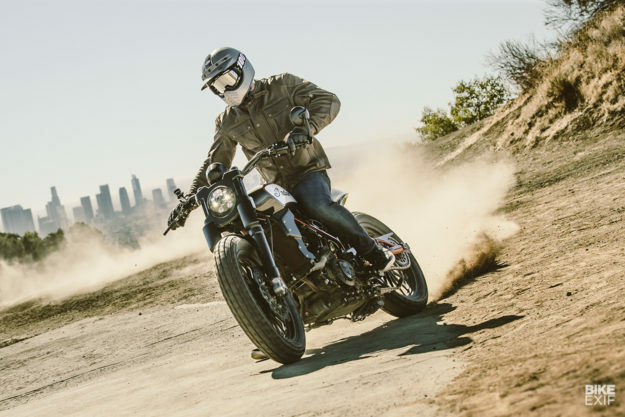 We’re told it’s a prototype, but we know it’s also a big step towards a production-ready Indian Scout tracker. 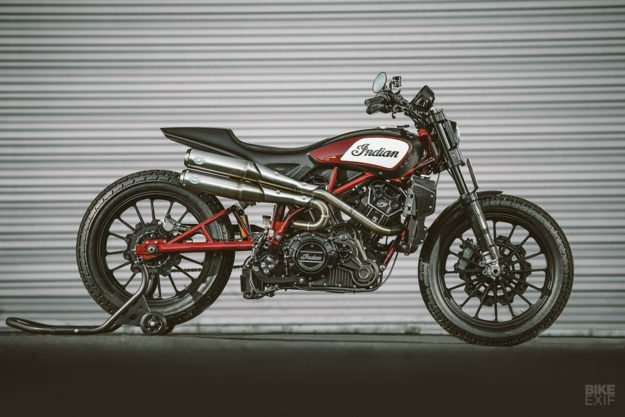 This is the world’s first glimpse of the FTR1200 Custom, to be revealed in the metal at the huge EICMA show in Italy. 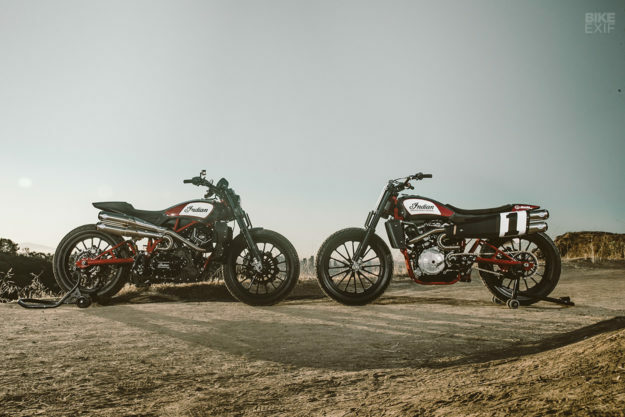 It’s inspired by the Scout FTR750 flat tracker, the race bike ridden by the Wrecking Crew to the first three places in the American Flat Track Series. 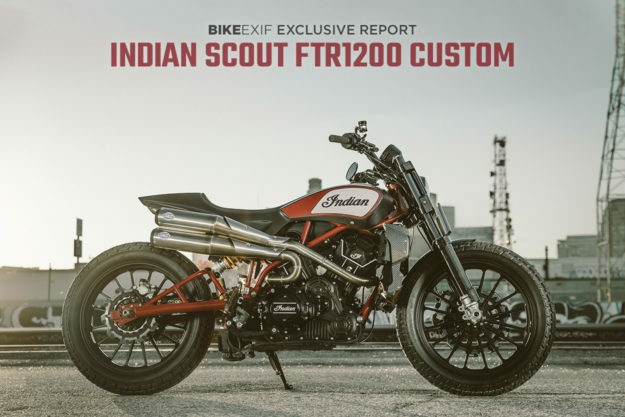 The FTR1200 has been built with the help of Indian’s race team, but it’s more than a thinly disguised racer. It’s a street tracker powered by Indian’s regular 1133 cc V-Twin road engine, which now exhales through a stunning set of high pipes. 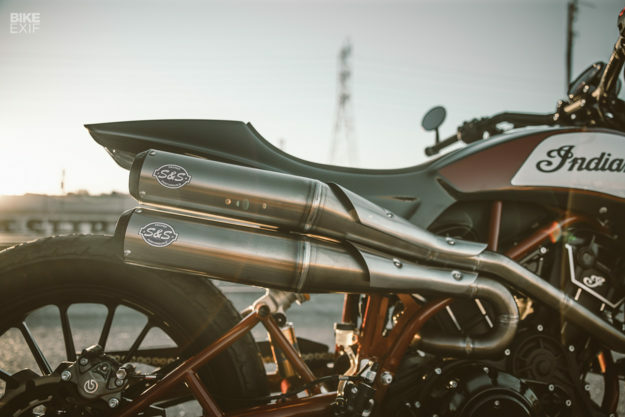 They come from S&S, who also hand-built the FTR750 race systems, and they’re routed to the right-hand side of the bike as opposed to the left of the race bike. 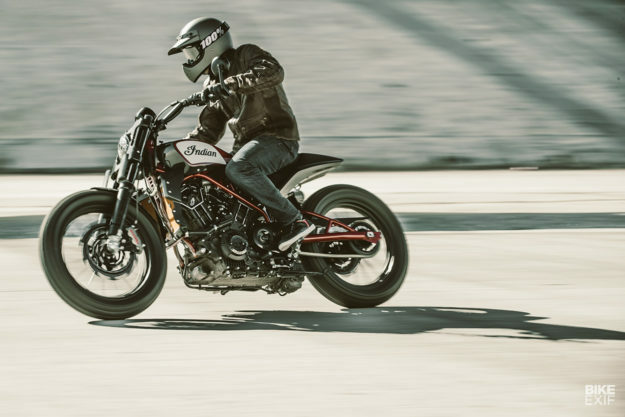 Indian has only revealed top-line specs of the FTR1200, but they’re surprisingly close to the flat tracker—for now. From the side, the 4130 chromoly steel trellis frame and swingarm look virtually identical. But on closer inspection, the twin front down tubes, widely spaced on the race bike, appear to have been squeezed together on the FTR1200—presumably for tighter packaging and a less agricultural look. The wheelbase on the racer is adjustable from 55 to 57 inches, but on the FTR1200 it’s fixed at 60. 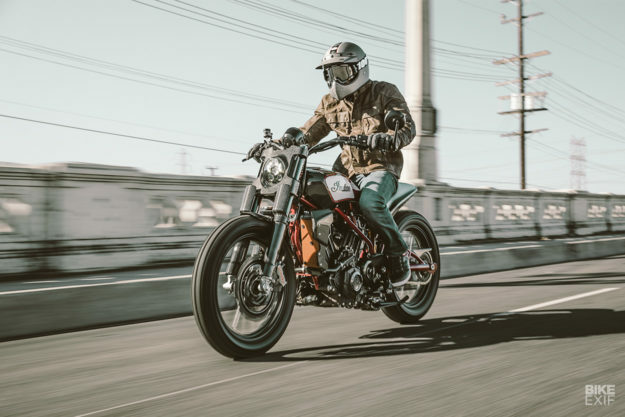 The FTR1200’s weight is apparently 427 pounds (194 kilos), which is pleasingly low—especially for a machine with a hefty 69 cubic inch mill. But we don’t know if that’s wet or dry, and we can expect it to rise if the FTR1200 goes into production. We’ll probably be saying goodbye to the carbon fiber bodywork, and definitely saying hello to emissions control pipework. The road-ready prototype appears to be wearing the same adjustable Öhlins suspension as the racer, which uses 43mm conventional forks and a monoshock. Rake is the same 25 degrees as the race bike, but trail is fractionally more—at 3.7 instead of 3.64 inches. 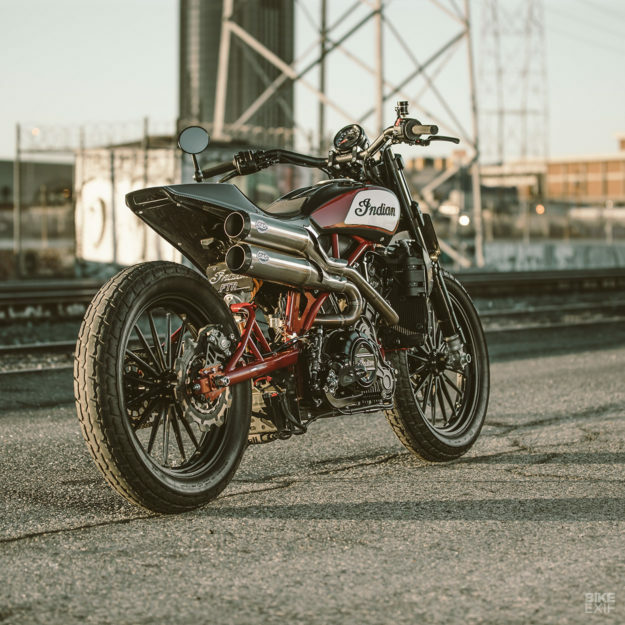 The wheels are carried over from the FTR750: RSD Traction Flat Track race wheels, which Roland Sands designed way back in 2004 when he was working for Performance Machine. They’re still the industry standard, and still look amazing. The brakes are Brembo calipers squeezing on Lyndall’s classy Crown Cut rotors. In FTR1200 trim, the 1133 cc road engine develops similar power to the 748 cc race motor, which is oft quoted at 110 hp at 10,000 rpm. But the road peak will be some 2,000 rpm lower down—and we’re pretty sure servicing intervals will be longer than the 30 hours of the racer, too. The bodywork is a two-piece carbon fiber unit that’s essentially the same shape as the racer, but with a slightly shorter tail unit. It has slightly less seat padding but more of a bum stop, and a slight upkick at the tail end. It’s all very pretty. 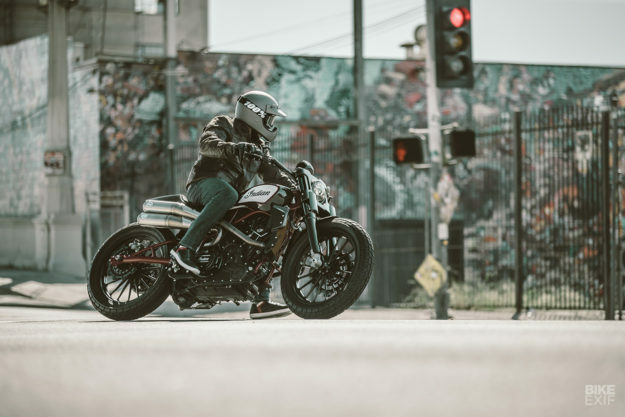 Tank capacity is listed at 2.2 gallons (8.3 liters), which is well down on the 3.3 gallons of the regular Scout and current model Harley-Davidson Sportsters. 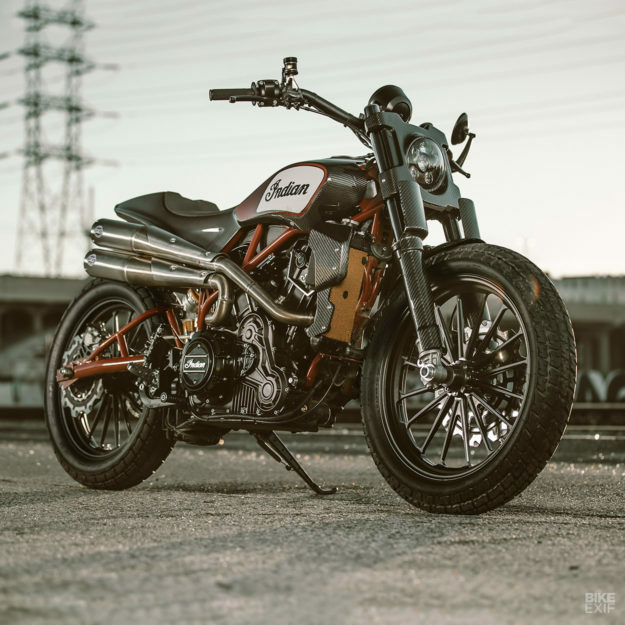 If the FTR1200 goes into production, something will likely have to change there. So what are the odds of seeing the FTR1200 in showrooms? The official line from Indian is tight-lipped. That means Indian are going to be listening to the clap-o-meter at EICMA over the next few days. And maybe also at the Progressive IMS shows, which will snake across the USA during the northern hemisphere winter. From where we’re sitting, it looks like a better than 50/50 chance we’ll see a showroom FTR1200. Indian has an aptitude for taking risks, an aptitude for performance, and a relentless drive for growth. 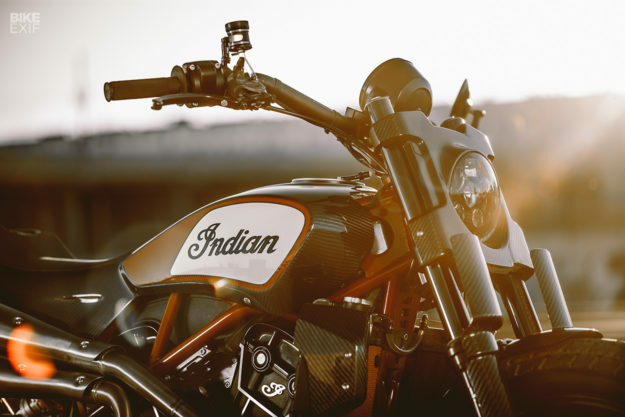 “Our goal is to build Indian Motorcycle into a global brand, which will mean going into consumer and model segments that we don’t currently compete in,” Wilson added. 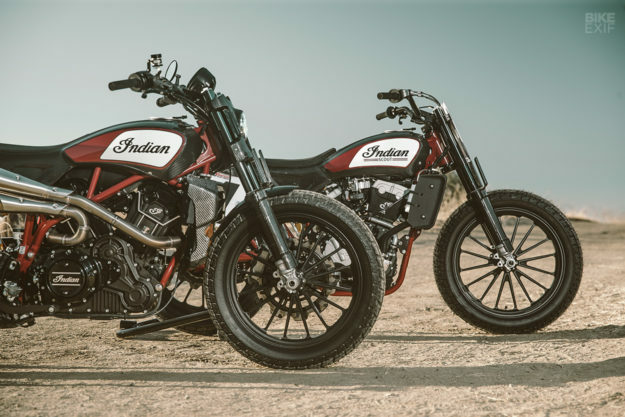 UPDATE 1 OCTOBER 2018: Indian has just announced the ‘FTR 1200’ (note the space) production model, due on sale in the first half of 2019. Full specs, prices and pictures here.